﻿ Black Ice Software - Print2RDP 6.00 with Static Printer name is Now Available! 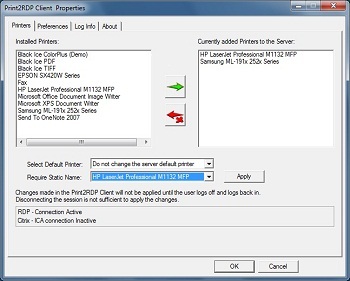 Print2RDP 6.00 with Static Printer name is Now Available! Convert any document in a remote session and output the converted document directly to the local client workstation! Static printer naming for RDP printing only available in Black Ice Software’s Print2RDP. The static printer naming allows users to mount a printer on the server without a session ID. To guaranty the unique printer naming on the server, every printer mounted on the server with static naming must have a unique name. The new release is a complete rewrite of the client printer driver mapping on the server. The Black Ice Print2RDP 6.00 does not use virtual printer technology like our competitors such as Microsoft Easy print or Citrix printer mapping. The Black Ice Print2RDP 6.00 provides more accurate printing by fully mapping the client printer device content including the Extended DEVMODE structure. This unique feature allows programmatic access to the local printers, such as configuring the printer driver from the Server. There are printing applications that require control printer specific settings for a given printer. With the fully mapped printer drivers on the server, now it is possible to move this dedicated application to the server. The final version of the Print2RDP is available for customers with maintenance free of charge. Please contact sales at sales@blackice.com to upgrade your existing serial key to version to 6.00.